Earlier this month I wrote on the four indispensable qualities of a leader. You can read that post here. When you look at good leaders you find they have three of these qualities. 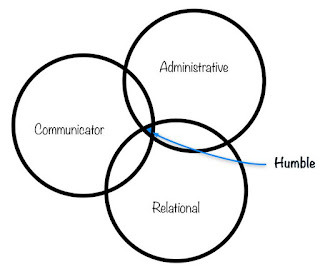 They are good communicators, are administrative and relational. 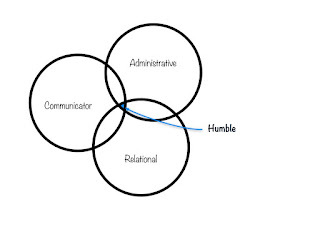 But if you are looking for a great leader they are going to line up these qualities in such a way to have humility stuck right in the middle to hold their leadership together. The greatest leaders are highly relational. They engage in conversation, have a great handshake, take an interest in you as a person and make you feel like a better person just because you've been in their presence. It's no secret that I'm an extrovert. Just last weekend I was speaking at a camp and I felt like I was with 300+ of my new best friends. I had a ton of conversations with people of all ages and stages in life. Just because I'm an extrovert doesn't mean that all great leaders are extroverted. Some people are refreshed just by being with others and some are refreshed by being with others. I've served with introverted and extroverted leaders. I've seen both of them be great at being relationship driven. These leaders have a great sense of people and spending time with them. They look people in the eyes, focus on their sentences and stay tuned in the conversation. One of my strengths is having WOO (You can read more about it in StrengthsFinder). WOO stands for Winning Others Over. The strength of WOO is that I love to meet new people. I enjoy conversation. I like to hear about people. The dark side is I can be easily distracted and leave the conversation to early. I can loose interest because I'm constantly thinking about winning another person over as my next friend (this is me being vulnerable). Great leaders know how to engage others in conversation. This conversation can be verbal, written, email or text. Craig Groeschel once told a story about his body posture in conversations. His friends informed him that in every conversation he kept his body turned to the side like he was waiting to leave the conversation. He improved on this and others felt more like he cared about them. Great leaders will look to engage you in a conversation, you don't always have to do the heavy lifting to find them. When they are in a public setting, and it's appropriate, they will strike you a conversation. For a pastoral leader it will be them who might ask how you're doing. They may ask how your Bible time is going or if you're connected in a small group. In other sectors it might look how Casey Niestat lives his life. Watch this video around the 5:30 mark to see this in play. When I train leaders I highly encourage them to ask people seven questions to show they really care. It's easy to ask, "How are you doing?" but the truth is, that's not really a question any more, it's a greeting we use in California. Ask people where they are from, what they enjoy to do, see if they have a family, where they went to college or what their favorite food is. I avoid asking about work because we don't want our work to define us. When I think back to the great leaders I've met, I've generally left the conversation feeling amazing. The leader may have affirmed something in my life. They leader might have asked me a question about myself or took an interest in what I was focusing on. A few days ago I was talking with a friend who attended a leadership event in Irvine. At this event there was a great leader who I follow Carey Neuhoff. He said the event was so small that he just hung out with Carey. He was bragging about what a great leader Carey is and how fun it was to see him. In his meeting Carey the first thing Carey said was something like, "Man, those are great shoes! I love them." He left that interaction feeling great! That is what great leaders do. When I first think of an administrative person I think of some of the phenomenal people I've worked with. I wouldn't consider myself veery administrative but I would consider myself organized. When I was a student ministry pastor my pastor once said, "Neal, look at your desk compared to mine. You are organized. You clean your desk every day before you leave the office." Have you ever worked with or around someone who is anything but administrative or organized? They can't make an appointment on time? Their desk looks like a small tornado hit and their car hasn't been washed in six months? It just looks like their life is haphazardly happening around them. Here are three things I've noticed about people who are administratively minded and organized. When I first started in ministry I had no clue how to manage my time. Someone would ask for help and I'd do it. A call would come and I'd drop everything to meet the person's needs. People loved how much I was helping them, but it wasn't helping my personal life. One night, at youth group, I asked a leader for help with something I had completely dropped the ball on. She looked at me and said, "Neal, don't make your failure to plan my problem." I didn't know how to manage my time. It wasn't till I was 29 that I really dove into this. Sophie was nine months old, my work responsibilities increased and I was in seminary. I met with a guy named Bill Randall who took an interest in my life. He helped me manage my time well and it was a game changer for me. I'm not one who likes to plan ahead but I was sick of people calling me at 12:15pm to see if I would make our lunch appointment. My inability to manage my time well spilled over, (probably better to say, rushed over) into my personal life. There was one night I came home for dinner. Charity was done and my food was cold. Charity reminded me that I said I'd be home around 5pm and it was 6:30pm. My personal world was in distress because I couldn't say "no" to other things. In my short 38 years on this planet I've learned that administrative people know how to keep their personal world in order. Most of them have a routine for sleeping. Many of them eat healthy and make healthy lifestyle choices. They do their taxes on time because they know a paycheck is coming. They keep their bills paid and life isn't a constant mess for them. When I was younger I had my desk organized but not really my personal world. Growing up was a quick process for me and I had to learn a ton. As you think about being administrative make a point to plan things out. Have a mental, or written, check list of what needs to be accomplished. Be mindful with your time and plan for margin incase somethings goes wrong. This probably goes without saying, but administrative people are thinking about what is coming next. I am more of a dreamer. I have great ideas (and horrible ones). I like to think about the future and so do administrative people. I've had many meetings with people who know that the next camp, vision meeting or sermon series is coming. They may not have all the details but they know it's coming. They want to be prepared and help make it a success. When you think administratively and live an organized life you actually help out those around you. An example in my current setting is this; I currently have a solid plan for the next four months of preaching. After that I have a penciled in plan for the next four months; we will probably do it and its getting more figured out. For the last four months of the year we have a fluid plan of what we're going to preach on. For us to have this at set is going to be a huge help to our team. People can find creative ideas. We have time to figure out a graphics package for the sermon series. We can even dream about the stage design with time to spare! Take some time today to plan the future with care. Seek the Lord in all these decisions. If you're not naturally administrative, you can learn. You might not want to exhibit all your energy to being administrative but I'm sure you can think of an area you can improve on. Earlier this week I wrote on the four indispensable qualities of a leader. You can read that post here. Generally when we think about communication we think of a person on a stage sharing. Keep that in mind but also think about other points of communication. Think about daily office conversations, think about written communication and conversations with your neighbor. In my world we generally call this preaching. I preach about forty-two times a year at my church. I also speak at about four camps a year. I am blessed with an opportunity to share the greatest message I've ever heard. It's a message about Jesus Christ that changed my life almost eighteen years ago. When I speak to large groups I am mainly looking for three things, preaching that impacts the head, the heart and the hands. Preaching that impacts the head speaks to the mind God has given each of us. It brings out historical context, explains difficult words, explains topics that aren't common conversations of our day. This means that I'm reading the Greek language to see the flow of a text and the form of the text. It also means I'm reading commentaries by men and women who are much smarter than I am. Then it is my role to help figure out what the person I'm speaking to needs to hear. A student doesn't want to hear about the Greek language but might be fascinated with history. As a communicator you have to understand your audience and what will appeal to their head. You can't solely speak to the head, you also need to speak to the heart. This is the emotional level of a person. It's the story that evokes emotion. You have an emotional connection with a person because of a common theme, a shared experience or a past emotion. Generally we call these speakers passionate speakers. They are great at grabbing our heart for a certain cause, the poor, the needy or for the Gospel. They speak directly to our heart and get us emotionally involved in the conversation. Finally we have the speak to the hands. This is the part of communication that drives you to action. For example the communicator might speak to your head and then grab your heart and finally call you to action. A call to action is needed in any great talk. This is what drives us love our kids better, to invest more in our marriages, to share the love of Christ with our neighbors and change the world. Next time you hear a speaker think of they hit all these areas. There are some Bible passages that might speak more to the head or heart so don't look for equal balance but look for intentionally in hitting these areas. Some people would rather communicate in small settings and not in large settings. Great communicators need to be ready to do either and both. A small setting might be a staff meeting, a board meeting or a gathering of volunteer leaders. What I've found is that I need to be more focused and intentional in these smaller settings. I need to be more prepared for a staff meeting than I think. You can average the amount of time you plan for the meeting by half the length of the meeting. This can also apply this to those who lead small groups in a church setting. You can tell if your small group leader is unprepared. You know they didn't read the book or prepare questions. But on the other hand, when they are ready it shows. You know they did their homework twice because they got this! In small settings the preparation needs to be spot on. Think about context and figure out what your small settings look like. When I plan for small setting meetings I think my prep time is about half the same amount of time as the meeting. For example, last week I taught on growing spiritually to our preschool staff. It was a room of about 8 people. It was material I'd taught before but I looked it over four days before and then looked it over the day of for about thirty minutes. When I prepare for our staff meeting I take the time to write the agenda, think through possible questions or concerns that might arise and come in as ready as I can. The longer you do this, the more of a habit it becomes and your preparation time reduces. Keep this in mind: When you are sharing in any setting it's better to be prepared than wing it. When we talk about communication this is an area that can get overlooked. For me, I prefer oral communication to written. Part of the reason I write this blog is to help me clearly gather my thoughts. I am an emotional guy and like to draw people into my stories. But when I write, I need to be short and concise. I like to think "less is more and better is better." I need to check my grammar and make sure my sentences are clear. We use written communication more than ever now. People are posting on social media. Emails are flying around the office. Blogs are being written. Newspapers are going out. Written communication is not going anywhere and great communicators need to be ready for this. Let's talk about our written communication. When texting we have freedom that we don't in emails or other forms. Mostly text messages are short and get to the point. You have grammar errors and lots of grace. Emails can be different. I expect that every email I write will be forwarded to someone. I'm not saying it is, but it can be. Therefore if I have a tough email to write I will write it one day and let it sit in my draft folder for a day. I might edit it, add to it or trash it. Sometimes in person is the best way to communicate but we don't always have that option. As you think about your communication be a constant learner and ready to improve in all possible ways! While serving in the Bay Area I had the privilege of working with a great man named Silvio. Silvio was a leader in our Usher ministry and honestly could have been my boss for all the wisdom that man has. On a regular basis we would get lunch to stay connected. I usually left the meals feeling like I was poured into more than he was. He was leading a company, spoke multiple languages, loved the Lord with all his heart, had a great marriage and two wonderful kids. I wanted to be more like him. One time, while having a meal together, Silvio told me that I was a great leader. 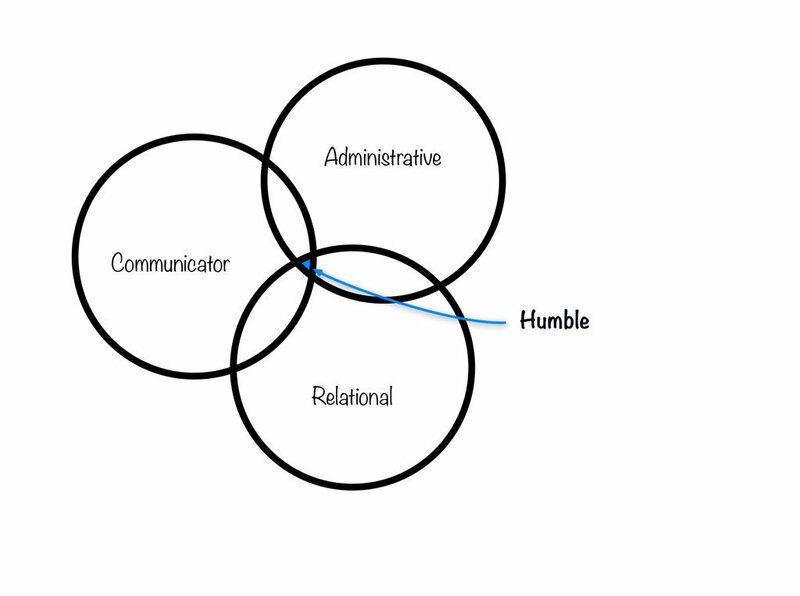 He said something like, "You're a clear communicator, have organizational ability and are very relational. Neal, you are the kind of the leader the church needs." I as thrilled to hear these words but wanted to talk more about the topic of great leadership with him. We continued on this topic for much of our lunch. We talked about guys who are very administrative but are tough to relate to. There are guys who are so relational that they forget to organize the details of their day. Then you have guys who are the best communicators but seem like they can't relate to others, they walk off stage and it's tough to connect with them. I called Silvio and told him about the vendiagram. What the church world needed to add to this was humility. I talked to my good friend Nick and asked him if he would draw this up for me real quick. He is a wiz and it took him no time at all. The circles overlap. When you get a guy who lines them up just right you get humility to fall in the center. Over the next week or two I want to write more about each of these topics as they relate to leadership. Last summer I attended the Global Leadership Summit and heard Bryan speak. His stories were compelling and heartbreaking. His delivery was spectacular but the pain in what he had seen was evident. Bryan is working in an area that many people would prefer to avoid and not engage. I got home and told my wife to which she replied, "I already read his book." I've been using the "Overdrive" app to listen to books lately. Since I had listened to Bryan and my wife already read the book I knew I needed to listen to this book. Within the five five minutes I was hooked. I listened to almost half the book on a drive home from Big Bear. Bryan shares real life situations about men and women who are placed on death row. Many of these people are minorities. Many of these people have no defense or at least inadequate defense. Many of the people are undereducated and unable to speak for themselves. Many of the stories are about people who have little income and no influence. One of the main stories features an ongoing trail about a man name Walter McMillian. I won't spoil the story but he is a man who was surrounded by friends and family but was a victim of racism and poor leadership. Walter was falsely accused and sentenced to death row for a crime he didn't commit. Bryan shares about the difficulty he had in helping Walter also shares numerous other stories. I highly encourage you to read (or listen to) Just Mercy!